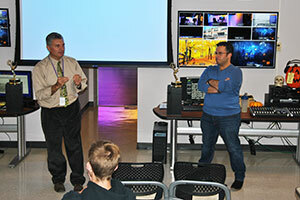 Dan Rosado, four-time Emmy award-winning video editor and 1997 Warwick Valley High School graduate, recently visited the high school to speak with Communications, Video Production and Journalism classes about his experiences in the broadcast industry. Now a Senior News and Sports Editor at NBC, Mr. Rosado shared many aspects of his professional world and work experience. Detailing the process of content creation, he produced and showed a short video to acc ompany his presentation, chronicling the daily activity required to bring a news story or sports segment to air. He also provided frank discussion about the hard work and dedication required for success in a highly competitive industry. Mr. Rosado was eager to convey to students how his Warwick education served as inspiration and foundation for his career. 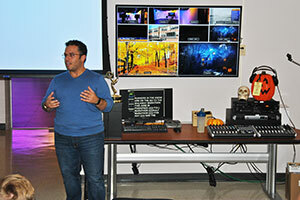 He recounted the first moment he was intrigued by the communications program at Warwick Valley High School. While sitting in class, he noticed students meandering throughout campus with video cameras on their shoulders. Fascinated by the idea of a “hands-on” learning experience, and the ability to create work that would have a larger viewing audience, he signed up for both photography and communications classes. Guided by the instruction of Photography teacher, Mrs. Blauner and now retired Communications teacher, Mrs. Hurd, Mr. Rosado quickly developed his skills and became deeply involved with many of the school’s video productions and sports broadcasts. 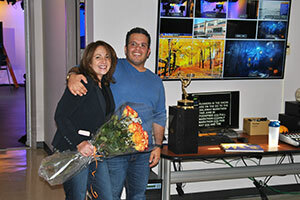 He continued his studies in Communications at Plattsburgh State University. 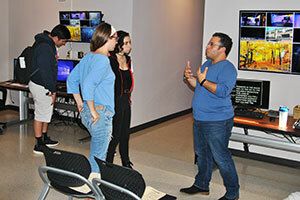 Reflecting on his professional journey, Mr. Rosado offered advice for those pursuing their future goals and aspirations: ”No matter what road these students take, be it TV, film or otherwise, they need to believe in their ability to do it, and allow that drive to propel them forward.